Alain Vigneault has pushed all the right buttons in the last five months to steer to the New York Rangers to their first visit to the Stanley Cup final in 20 years. The start was rough. The middle was better. 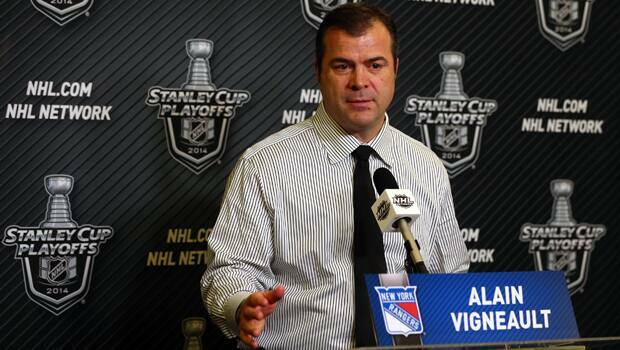 But the last five months have been a blast for the New York Rangers and their fans with Alain Vigneault at the helm. But the 53-year-old, first-year head coach wondered what he got himself into last fall. Because of the massive renovations to Madison Square Garden were in its final stages, the Rangers held their training camp in Banff, Alta., and were forced to start the season on the road. The losses mounted and the Rangers returned home with a 3-6-0 start. Doubt already had set in whether it was a good move by Rangers general manager Glen Sather to say goodbye to John Tortorella last May and hello to Vigneault a month later. Asked the other night what he would have said last October if told that the Rangers would be in the Stanley Cup final, Vigneault said with a chuckle, "In October? I probably would have said, 'What are you smoking?'" "We worked our way and improved how we played," he continued. "We came along in the second half and found a way to get in. "Ever since we've gotten in, all the series have been so competitive and so hard fought. We've gotten the goaltending we need and we've found ways to win." Vigneault needed time to establish his system. Sather needed to tinker with the lineup. Goalie Henrik Lundqvist neded to find his game. Slowly, all these developments came together. The turning point may have been on Dec. 29. The Rangers woke up that Sunday morning with an 18-19-3 record and five points out of the playoffs. One of Sather's key acquisitions, backup goalie Cam Talbot, had played in the previous two games because of Lundqvist's struggles. Later that evening in Tampa Bay, with Lundqvist back in goal, the Rangers prevailed with a 4-3 win. Lundqvist made 37 saves against Martin St. Louis and the Lightning. The victory ignited a 27-12-4 finish to make the playoffs. On the exact one-year anniversary of Tortorella's firing, the Blueshirts clinched a spot in the Stanley Cup final. "I just felt the patience from the entire coaching staff," Lundqvist said. "They understood. "We talked about this earlier, but they understood the process for us to get to where we needed to be to be a successful team. We did change a lot of things going into the season. "I think it was a time where we had to find ourselves a little bit as a group." Beside the obvious differences in their personalities - Tortorella's bombast and hard-driving ways to Vigneault's calmness and sense of humour - the new coach wanted to spread out minutes played with four lines and three sets of defence. He wanted to activate his defencemen offensively. He wanted to give his star players more latitude to perform in the offensive end. As a result, top-six players like Brad Richards and Chris Kreider, two players who often felt Tortorella's breath on the back of their necks, had bounce-back seasons. Rangers blue-liner Ryan McDonagh enjoyed his most productive season yet with 14 goals. The fourth-line of Dominic Moore, Derek Dorset and Brian Boyle has contributed, especially in the playoffs. The additions of Moore, Talbot, Kevin Klein, Dan Carcillo and St. Louis, at different times during the past 12 months, have helped make the Rangers better. But maybe more important has been the calm demeanour of Vigneault and assistants Scott Arniel, Ulf Samuelsson and Daniel Lacroix behind the bench. "Well, we're not there yet," Vigneault said.